The stock transfer US revenue stamps of 1940-1952 are identical to the "red" US documentary stamps of 1940-1958, with the exception of the inscriptions and the color. The new stock transfer stamps are all engraved, perforated 11 or perforated 12, watermarked USIR, and they are all printed in bright green (varying shades). US revenue philatelists refer to these stamps as the "GREENS". As would seem appropriate for US revenue stamps, these stamps feature the portraits of former Secretaries of the Treasury. 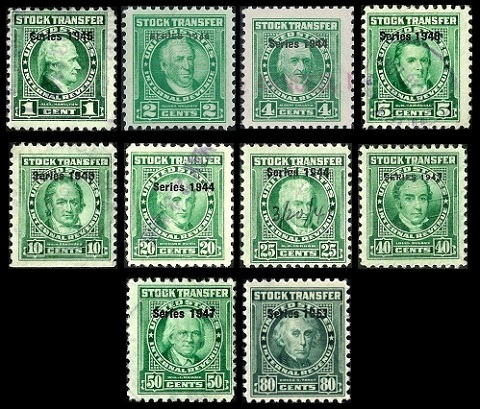 Various denominations of these stock transfer stamps were issued every year between 1940 and 1952. Each year, the stamps were overprinted with "Series" and the current year date. During this period 312 different stock transfer US revenue stamps, as listed in the Scott catalog, were issued, and this number only accounts for the major varieties. In order to make the review of these stock transfer US revenue stamps easier to digest, webpage-wise, I have broken them down into three different groups, separated by denomination ranges. In order to illustrate ALL the denominations of the stock transfer US revenue stamps that were issued during the lifetime of this series, I have used the following images: The Cent denomination and the 1 Dollar through 20 Dollar denomination images have varying series dates. The 30 Dollar through 10,000 Dollar denomination images are all from "Series 1950". 01 C. (Sc. #RD67) - Alexander Hamilton (1755-1804) - Secretary of the Treasury (1789-1795). 02 C. (Sc. #RD68) - Oliver Wolcott, Jr. (1760-1833) - Secretary of the Treasury (1795-1800). 04 C. (Sc. #RD70) - Albert Gallatin (1761-1849) - Secretary of the Treasury (1801-1814). 05 C. (Sc. #RD71) - G. W. Campbell (1769-1848) - Secretary of the Treasury (1814). 10 C. (Sc. #RD73) - William H. Crawford (1772-1834) - Secretary of the Treasury (1816-1825). 20 C. (Sc. #RD74) - Richard Rush (1780-1859) - Secretary of the Treasury (1825-1829). 25 C. (Sc. #RD75) - S. D. Ingham (1779-1860) - Secretary of the Treasury (1829-1831). 40 C. (Sc. #RD76) - Louis McLane (1786-1857) - Secretary of the Treasury (1831-1833). 50 C. (Sc. #RD77) - William J. Duane (1780-1865) - Secretary of the Treasury (1833). 80 C. (Sc. #RD78) - Roger B. Taney (1777-1864) - Secretary of the Treasury (1833-1834). Stock transfer US revenue stamps were discontinued in 1952.